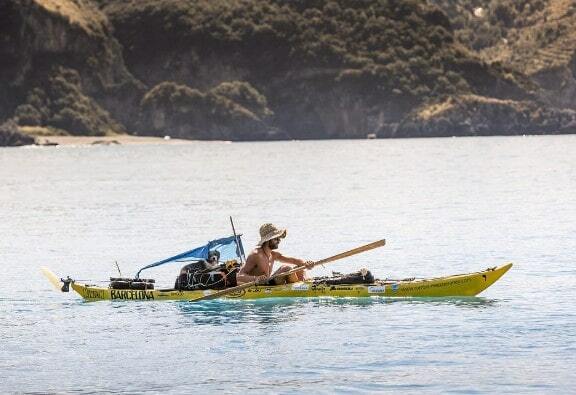 An intrepid kayaker decided to make a new life after handing in his notice as an engineer and paddling into the sunset to travel around the Mediterranean Sea. Sergi Basoli, who comes from the Spanish city of Barcelona, took the leap to quit his job so that he could freely experience the unsurpassable waters and spectacular sandy beaches the Mediterranean has to offer, and has be doing so for the past three years. What’s more, Sergi has expressed that he’s not even thinking about stopping his adventurous life on the water any time soon. Sergi has, in the last 36 months, clocked up 3,106 miles in just a kayak, and said that he fell in love with the idea of adventure after watching Indiana Jones films when he was younger! In 2013, Sergi set off for his new life at sea, paddling out of the Olympic Harbour in Barcelona before cruising his way down around some of the best coastlines, not only in the Med, but the world too! Although Sergi began his adventure alone, just a year in he found a new companion – an adopted dog by the name of Nirvana – who has made a star for herself on Instagram thanks to the popular hashtag SailorDog. Sergi funds his inexpensive way of life by making shells into rings, necklaces and earrings for people to buy. Sergi spends very little, around €200 a month in fact, which is around £157, that he spends on food. He prepares his meals on a small, portable, self-made stove stored at the front of his kayak to accompany the fresh fish he catches with nothing but a line, hook and bait. The sea-faring man and his four-legged friend enjoy taking the journey day-by-day, travelling around six to 18 miles in a day, with the weather and sea conditions as the gauge for how far they are going to venture each day. Possessions aboard the kayak are minimal, which comes as little surprise as space is at a premium abroad Sergi’s vessel, but one thing’s for sure, Sergi and Nirvana are enjoying every minute of life together and they are currently living out what some people only dream of! Here at Outdoor Adventure we can’t take you on kayaking trips for three years, but our activity holidays will give you a wonderful taste of what Sergi and Nirvana are experiencing in our own little slice of paradise, here in North Cornwall.